Who am I? I'm a person who greatly enjoys life - My most avid hobbies are music, cycling, puzzles, cats, mathematics and computer science, and my job as a mathematical/computer-science researcher is not only profitable, but also lots of fun. Anyway, the only things I don't love are petty, bullying behaviours such as this which constrain the human spirit and accomplish nothing positive, but hey, I remain a free person with a sense of humour who will continue to do my best to make the world a better place and to try to inspire others to give their best without paying any regard to such reproaches! with my niece, Sarah on Christmas day in 2006. In terms of music, I play flute and piccolo in two orchestras, a wind quintet and miscellaneous ad hoc groups. The viola comes out whenever the opportunity arises. 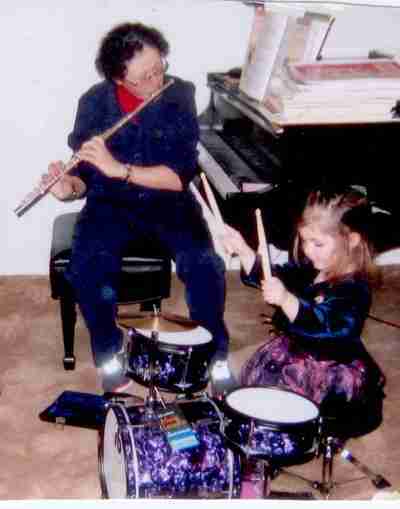 More recently, starting in February 2009, I began learning the oboe, and am astonished at how well that is going. It has added colour to various music parties, and I absolutely love playing it. In terms of cycling, I love to ride. I did 22,060 km in 2010 which is 60.44 km per day. I also love to ride time trials and have done more than 11,000 km of them over the past 25 years. Yes, and I run a mathematical time trial web site ( www.timetrial.ca ) to allow you to analyze your results in any of the series which I show, and as well run the CKAP web site where members can track their distances ridden over the years. Note that I provide the timetrial.ca service to you entirely free of charge. If you'd like to send me nice comments about my time trial site which I can publish on the site, send me an email. During a time trial on 2009-May-19 (photo by Paul Young). I love puzzles and have a couple posted on here. I'd form various other ones if I had time. 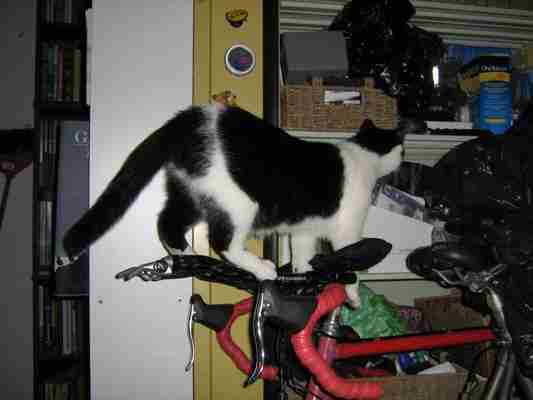 Here is a picture of Spook in 2008 using the bike as a vantage point for satisfying her curiosity. My cats are a constant source of amusement for me. There's Spook, the climbing leader who does everything from laundry racks to bicycle aero bars to ladders, and her brother Shadow who quietly works behind the scenes until he can do everything his sister does! I permanently have a ladder in my loft for them to enjoy.